This Toronto Jazz Festival show featured the intriguing pairing of soul veteran Lee Fields and comparative newcomer Allen Stone. Though termed a double bill, Fields and his band the Expressions opened and played a significantly shorter set than Stone. In fact, after the obligatory two-song warm-up from his band, Fields was onstage for just 40 minutes, but he used his time well. He is a genuinely old school soul and funk singer, one who has been honest about the stylistic debt he owes James Brown (his nickname is Little JB). Like Brown, he's quite the showman. Upon making his entrance in a loud Don Cherry-like sports jacket, he declared, "Let's get it started," and instantly had the crowd clapping along to opening cut "Just Can't Win." They joined him in the call and response of "Talk To Somebody," but some of the crowd participation bits eventually got a mite tiresome. He still has a strong and soulful voice, one equally at home on ballads like "Don't Leave Me This Way," from his latest album Emma Jean, and more uptempo funk-tinged numbers. After removing his jacket on the hot and sultry night, Fields became more physically active, nailing some JB style circle spins. He's certainly expressive, but his six-piece band were rarely more than functional, lacking a truly funky groove that would have taken things higher. Fields saved the best for last though, serving up a killer version of one of his best-known tunes, "Faithful Man," one that merited the standing ovation it received. 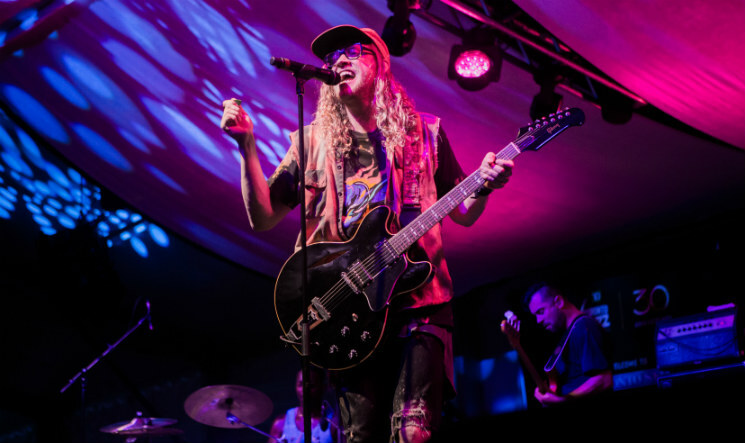 While he's also described as a soul singer, Allen Stone's sound has quite a different vibe from Fields. It's more along the lines of '70s and '80s blue-eyed pop-soul, with some tunes hinting at mid-period Robert Palmer. There was a nod to Prince in a 1999 organ riff at one point, and Stone's occasional falsetto also evokes the late great one. Stone certainly doesn't look the part, with his ripped jeans, trucker hat and long hair making him appear more like a grunge fan (he is from Washington State) than a soul man. He knows how to work a crowd though, and the audience here were quick to follow his onstage instructions to clap along and make various hand gestures. His beaming smile and infectious charm did go a long way in covering up the at-times banal melodies and lyrics ("love is like freezer burn") of the material. He accompanied his four-piece band on guitar for much of the set, though put it down for some of his material, as on the strong "American Privilege." Another highlight was "Unaware," perhaps his biggest song to date, and a real crowd favourite. It was punctuated by the sound of torrential rain outside, prompting Stone to launch into a free-wheeling bout of testifying: "This life is crazy… there is crazy rain out there. Thanks for the people who put up this tent to keep us dry. I'm thankful for my ears… my crazy body is full of atoms.."
As the set progressed, songs such as "Your Eyes" turned into lengthier jams, though the tedious drum solo was not a smart move. The audience lapped it up though, and their response to his show suggests Stone is a real contender.